Written by: Jan-Hein Bal, EYE Film Institute The Netherlands Date: 11.06.2008. Exterior of Du Midi cinema with announcement WEST SIDE STORY 2nd year, March 1963. Du Midi was Amsterdam’s first and most successful 70mm cinema and started 70mm projection in 1960 with "Porgy And Bess". Other long runs included "West Side Story" (1962, 93 weeks), "It’s A Mad, Mad, Mad, Mad World" (1964), "The Sound Of Music" (1966) and "Funny Girl" (blowup 1969). Du Midi showed 70mm during many years until about 1978 and closed 1982. 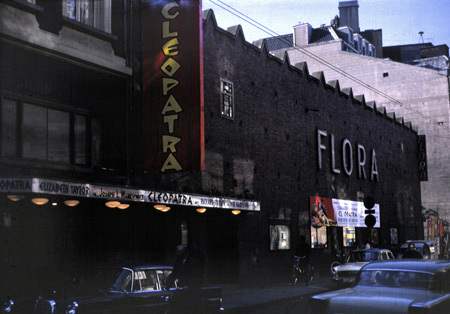 Flora cinema bought 70mm projectors in 1961 for "Can-Can" and their greatest successes were "El Cid" (1961), "Cleopatra" (1963) and "My Fair Lady" (1964, 48 weeks). In later years no 70mm was shown anymore and Flora closed 1980. 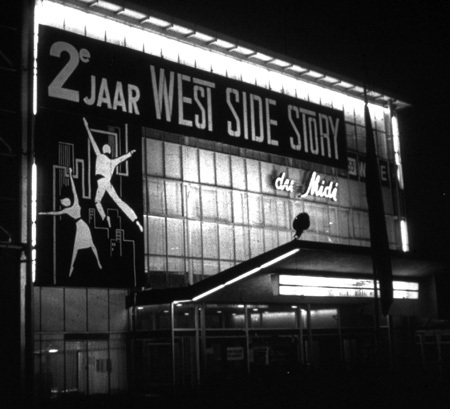 Nöggerath cinema received 70mm projection in 1963 to continue "West Side Story" from Du Midi but had never 70mm releases and other revivals are uncertain. The building is now part of Tuschinski. During many years Du Midi and Flora were the two 70mm roadshow cinemas in Amsterdam, until 1965 with two additional 70mm cinemas. Since then many 70mm prints were released, starting with at least seven titles in 1965. Calypso cinema started 70mm screenings with "The Agony And The Ecstasy" in 1965 and had great success with "Play Time" in 1968. It was a minor 70mm cinema like all further commercial cinemas except Bellevue Cinerama. Calypso closed 2006. 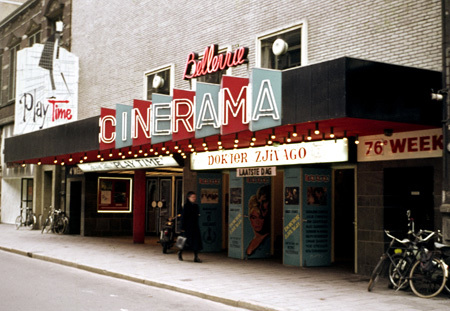 December 1965 Bellevue Cinerama opened as third and final 70mm roadshow cinema. "The Hallelujah Trail" was the first of many exclusive 70mm screenings which were obligatory for later Cinerama cinemas. Because of this and diminishing 70mm production Bellevue released the first 70mm blowup in Amsterdam with "The Great Race" in 1966. This and blowups "Doctor Zhivago" (76 weeks) and "The Wild Bunch" were Bellevue’s greatest 70mm successes. The opening of Bellevue marked a long period where you could often choose between several 70mm titles. 1968 had a peak of eleven releases including "Around The World In 80 Days" reissue. A highlight was the Stanley Kubrick 70mm “double bill” in 968 with the simultaneous release of "2OO1: A Space Odyssey" in Bellevue and "Spartacus" reissue in Flora. 1966 the Rembrandtpleintheater cinema opened but not before 1969 "Hello, Dolly!" was the first and only 70mm screening. The cinema already closed in 1986. The famous Tuschinski cinema even needed more time because after its 70mm installation about 1963 it lasted until 1969 for the first 70mm showing with the "Gone With The Wind" blowup. Further only the 70mm release of "Far And Away" is certain. City cinema received 70mm projection not before 1969. With the 70mm reissue of "Ben-Hur" in 1970 City started a 70mm revival until "Patton" in 1977. It still exists but unlike Tuschinski is totally altered. With the demolishing of the Bellevue Cinerama louvered screen in 1978, the closure of Flora in 1980 and Du Midi in 1982 and lack of 70mm productions the boom was over. Since then mainly blowups were released and only non-commercial cinemas received further 70mm installations for revivals. Desmet cinema started in 1984 a long series of 70mm revivals and imported 70mm restorations like "Lawrence of Arabia" in 1991 and "Spartacus" in 1993 (also shown during the cinema closure in 2000). 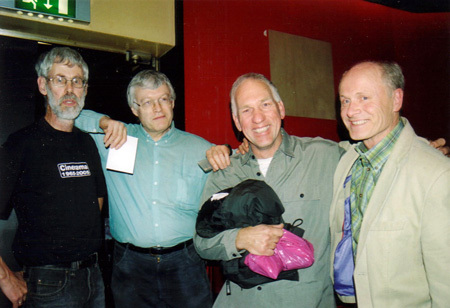 1992 the Filmmuseum Vondelpark started its many 70mm screenings with a "Heaven’s Gate" blow up, sometimes together with Desmet, like the ‘Size Matters’ festival in 2000. Filmmuseum Vondelpark closed 2012 and moved to the EYE Filmmuseum building. 1989 "The Abyss" blow up marked the end of regular 70mm screenings in Bellevue. Since 2003 the Filmmuseum Vondelpark moved its 70mm screenings to Bellevue during the last years, with annual ‘Widescreen Weekends’. As Filmmuseum Cinerama it closed 2006. Pathé Arena cinema had many 70mm Imax DMR blowup screenings between 2005-2009 until it was digitized. 2012 the EYE Filmmuseum opened its futuristic building, including incidental screenings of their own new 70mm prints "Playtime", "West Side Story" and "The Master" besides 70mm vintageprints. Finally there were some mobile (Cinema 180) and open air 70mm screenings in Amsterdam. 2014: Jan-Hein Bal is currently writing the Soviet 70mm cinema history in a book called "Red Widescreen"